Here is my Breton Spellsword, Kayllana. This is her Azural Glow Dagger that she is holding, it is enchanted with FireBall. Good for toasting tasty mudcrab treats. yummm! 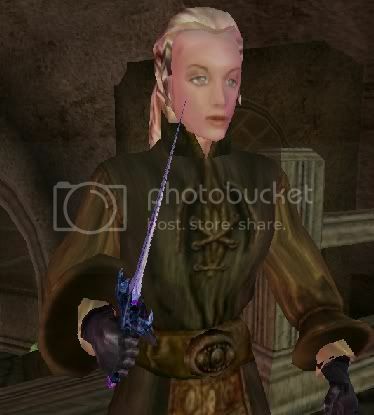 Remember the Glory Days of Morrowind Mods? Visit Gamersroam Archival Download Library of 1032 old Morrowind Mods and take your pick. Just register and enjoy the good ole days! A bit late, I guess, but hey! I didn't get into Morrowind until last year, due to it not working on my old computer. Edited by Jazhara7, 19 March 2008 - 06:13 PM. I'll see if I can dig up some old screenshots later today. Ah, yes. Julan. He's so lovely, in his own, sometimes somewhat grating way. Edited by Jazhara7, 20 March 2008 - 04:22 AM.